Wisteria (also spelled Wistaria) is a genus of flowering plants in the pea family, Fabaceae, that includes ten species of woody climbing vines native to the eastern United States and to China, Korea, and Japan. Aquarists refer to the species Hygrophila difformis, in the family Acanthaceae, as Water Wisteria. Wisteria vines climb by twining their stems either clockwise or counter-clockwise round any available support. They can climb as high as 20 m above the ground and spread out 10 m laterally. The world's largest known Wisteria vine is in Sierra Madre, California, measuring more than 1 acre (0.40 ha) in size and weighing 250 tons. The leaves are alternate, 15 to 35 cm long, pinnate, with 9 to 19 leaflets. 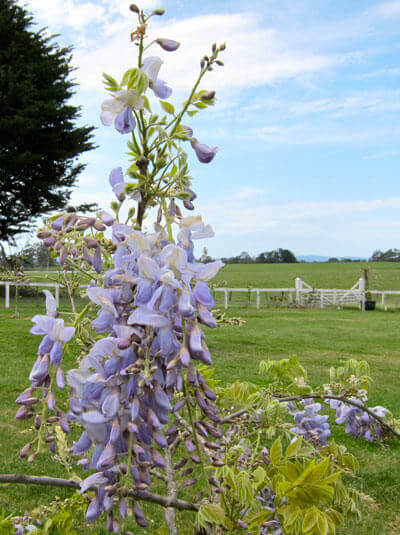 The flowers are produced in pendulous racemes 10 to 80 cm long, similar to those of the genus Laburnum, but are purple, violet, pink or white, but not yellow. Flowering is in the spring (just before or as the leaves open) in some Asian species, and in mid to late summer in the American species and W. japonica. The flowers of some species are fragrant, most notably Chinese Wisteria. The seeds are produced in pods similar to those of Laburnum, and, like the seeds of that genus, are poisonous. Some species are popular ornamental plants, especially in China and Japan. Wisteria is very hardy and fast-growing. It can grow in fairly poor-quality soils, but prefers fertile, moist, well-drained ones. It thrives in full sun to partial shade. Wisteria can grow into a mound when unsupported, but is at its best when allowed to clamber up a tree, pergola, wall, or other supporting structure. Whatever the case, the support must be very sturdy, because mature Wisteria can become immensely strong with heavy wrist-thick trunks and stems. Its pendulous racemes are best viewed from below. Wisteria flowers develop in buds near the base of the previous year's growth, so pruning back side shoots to the basal few buds in early spring can enhance the visibility of the flowers. If it is desired to control the size of the plant, the side shoots can be shortened to between 20 and 40 cm long in mid summer, and back to 10 to 20 cm in Autumn.